This large house is in a private and quiet location only a short walk to Byron's famous beaches, restaurants, cafés and boutique shopping. The Green Garage is just around the corner where you can purchase delicious food, coffee and groceries 7 days a week. You can enjoy your holiday without a car because everything you need for the perfect Byron Bay holiday is at your finger tips. The ground floor has three spacious bedrooms and a family sized bathroom. The two master bedrooms have a king size bed plus a sofa and ensuite with an exquisite double shower and luxury bath tub as well as televisions and DVD players. Another bedroom features a queen size bed with a television and DVD player plus ensuite. There are also two bedrooms with single beds and beautiful mountain views. The kitchen is fully equipped and there is a spacious living room downstairs big enough for everyone to enjoy. The new in ground pool is next to a large covered gazebo with BBQ facilities. Experience the unique atmosphere of Byron’s town centre. Close to everything Byron has to offer including a variety of restaurants, cafes and boutiques right on your doorstep. The pristine beaches of Byron Bay are only a short leisurely stroll from your holiday accommodation. 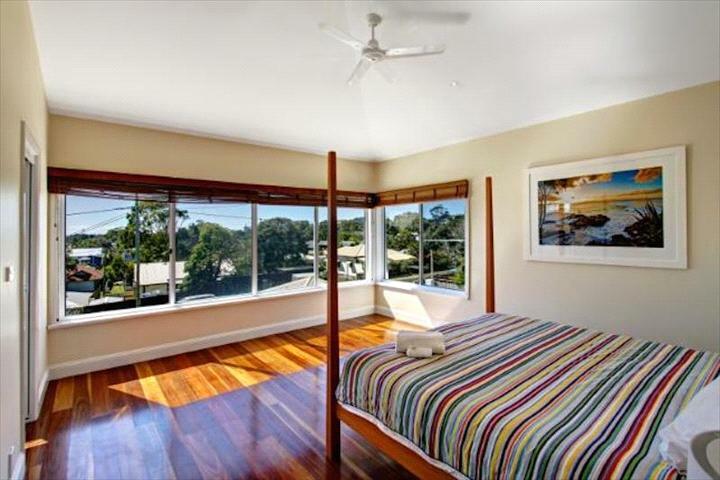 Away on Seaview is situated 10 mins walk to town, 10 mins walk to Clarkes Beach.